After struggling with his shot early in the season, in the last two games Seth Schenck is a combined 10-16 from the field and 2/5 from three point land, overall shooting 60% compared to 43% before Christmas, but mostly had struggled shooting from behind the arc. Before Christmas Schenck was 24% while shooting 40% since the break. New Haven, Mo. - There is a lot of basketball still to be played but if New Haven’s first two games since Christmas is any indication of what fans can expect to see it could be a fun next couple of months. Friday night New Haven scored a season high 61points in their win over Bourbon (61-43) and was the second straight game the Shamrocks shot over 60% from the field and three players in double figures. 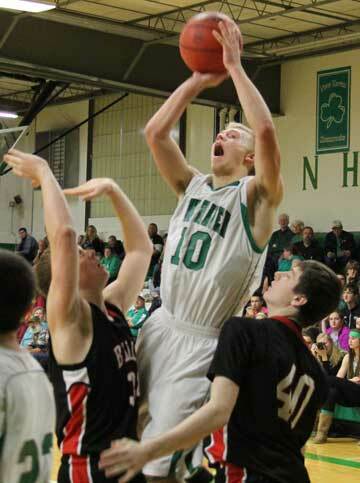 Kyle Ruediger led the way for New Haven, scoring a game high 22 points, 4 assists, 3 steals, and 5 rebounds. 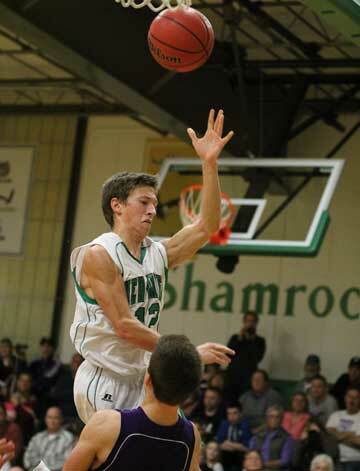 “Kyle had a really good all around game… scoring and a nice job of passing the ball”, Steinhoff said. 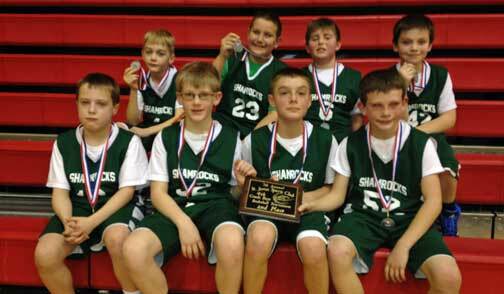 New Haven’s 4th grade boy’s basketball team had a successful weekend in the St. James Tournament, winning second place after advancing into Saturday’s championship game. Photo courtesy of Mark Laune. Spring Bluff, Mo. 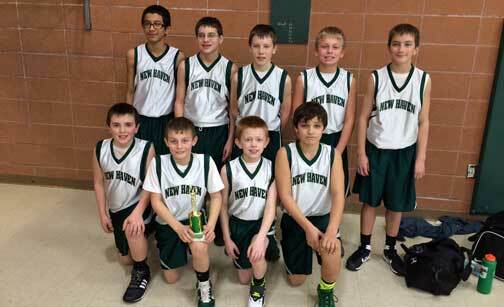 - This weekend New Haven’s 6th Grade boys team competed in the Spring Bluff Tournament after coming up short in last weekend’s third place game of the New Haven Tournament. Hermann, Mo. 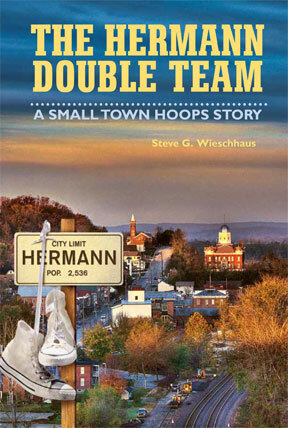 - “The Hermann Double Team: A Small Town Hoops Story”, a book written by Steve Wieschhaus, will be release on Saturday, February 1st at 3 PM in the lobby of Hermann High School. A discussion of the book will be held in the school library at 4 PM and is open to anyone that is interested in attending. This book signing event will be held in conjunction with Hermann High’s celebration of 100 years of basketball in Hermann high schools, where all former basketball players at either Hermann High or St. George will be recognized that evening. Both of these events will be held in conjunction with the Hermann High School basketball tournament. New Haven, Mo. 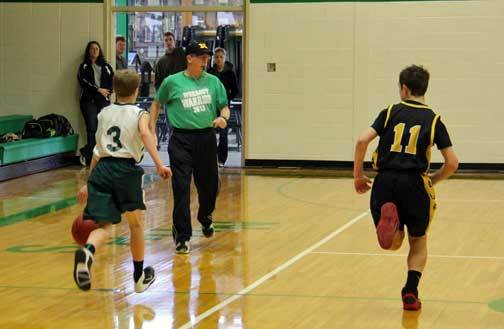 - Photos from this morning’s action at the New Haven 6th Grade Tournament first round game between New Haven and R-2. Seth Schenck drives and draws the foul early in the second quarter, hitting one of two free throws. New Haven, Mo. - Four Rivers Conference rivals, New Haven’s Winter Ball Coronation, and the Shamrocks final game against state ranked (#10) Pacific before heading into Christmas Break created an electrify atmosphere in last Friday's game. 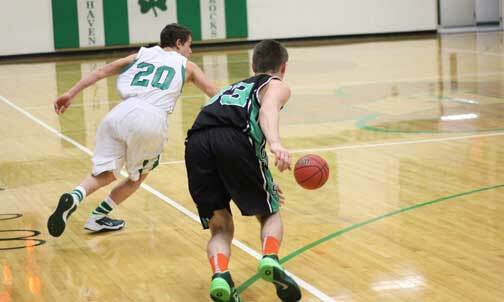 Friday night’s game saw two great defensive teams flat out guard each other and their game stats reflected it. New Haven shot 29% (11-28) from the field while Pacific was no better, shooting just 28% (11-39). Pacific’s Cullen Vanleer scored a game 20 points, 11 of them coming in the first quarter and five of the 11 in the final minute, and was 9-11 on free throws. Seth Schenck led New Haven with 12 points while Brandon Carey had a career high 12 rebounds, two steals and two assists. 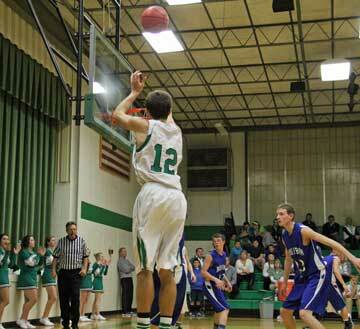 Ross Seitter forces one of several Silex turnovers in the second quarter. New Haven, Mo. - After their 43-32 win over Silex Tuesday night, picking up their fourth straight win and off to their best start since 2011 (5-1). “Tuesday was a big win… a must win going into Friday night’s game against Pacific, who will my far be the best team we’ve faced so far.”New Haven’s defense and rebounding has contributed to their early season success, holding their opponents’ to an average of 32 points per game and controlling the boards, which was a key in Tuesday night’s win. New Haven, Mo. - New Haven (4-1) enters this final week before Christmas break having won their last three games, defeating Clopton by 10 points in consolation game of the Montgomery County Tournament before clobbering Grandview by 30 last Tuesday. Seth Schenck makes just one of New Haven’s two field goals in the third quarter. Montgomery City, Mo. - Tuesday night was the first time in three years New Haven has lost the opening game of the Montgomery County Tournament as Bowling Green held off the Shamrocks after nearly blowing 19 point fourth quarter lead. Bowling Green’s 6’4’’ sophomore Josh Early gave New Haven troubles, scoring 13 of his game 16 points in the first three quarters. Kyle Ruediger and Ross Seitter led the Shamrocks with 15 and 13 points, each scoring seven of their points in the fourth quarter. New Haven, Mo. - New Haven held off Belle late in the fourth quarter to win their season opener 48-40 led by junior guard (pictured left) Kyle Rueidger’s double-double, scoring a team high 14 points and 13 rebounds. 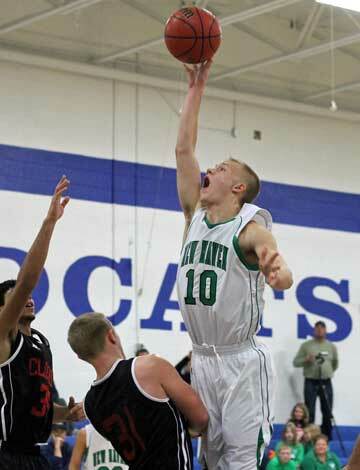 “Kyle did an outstanding job of controlling the boards for us on both ends of the floor,” Coach Ray Steinhoff said. Along with Rueidger, Seth Schenck (14 points) and Alex Poggas (11 points) both scored double figures. “Last year I our kids looked at Kyle maybe to much. 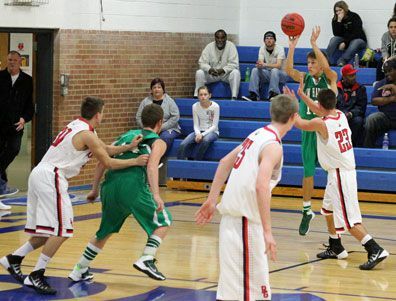 It was good seeing both Seth and Alex as well as Ross [Seitter] (8 points) aggressive on the offensive end.